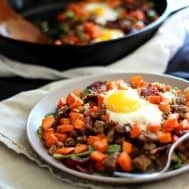 A savory, hearty, and healthy meal for any time of day, this Roasted Carrot Hash with Ground Beef and Bacon is also Paleo, dairy free, grain free, low carb. and Whole30 friendly! Roasting the carrots brings out their full flavor which combines so well with savory beef and bacon. I really don’t give carrots the proper love that they deserve. This recipe was inspired by me walking through a local Asian market, looking for my beloved sweet potatoes, only to glance over at the gorgeous carrots, feel strangely guilty that I never buy them, and then feel compelled to buy, um, too many. What the heck am I playing out in this carrot scenario? I’m getting the feeling this is about more than just carrots, but, I’ll save the self reflection for another post. 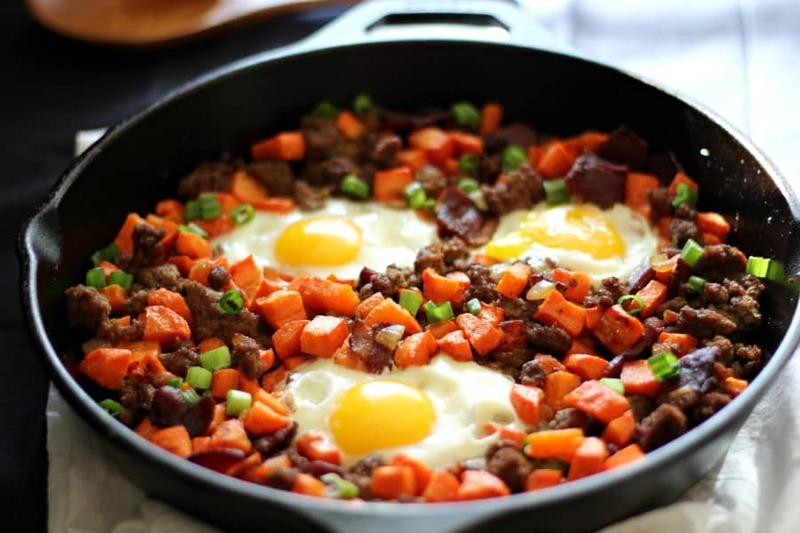 Today, it’s all about this recipe – another great hash recipe – although this one is slightly different because 1) it uses carrots instead of a potato, plantain, or squash and 2) I roasted rather than pan fried the carrots to fully bring out their great flavor, and also to crisp them up just a bit. I wasn’t about to treat the carrots any less than the absolute best after neglecting them for so long! 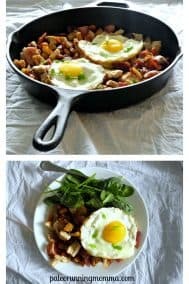 Another unique feature of this hash is that I used the duck bacon I received from D’Artagnan a few weeks back, which was completely new to me and added a bit of a different sort of smoky flavor to this hash. Of course, any bacon of your heart’s desire will work for this recipe, because really – when does bacon NOT work?! I’ve yet to meet a type of bacon that I truly didn’t like. The closest might be lean turkey bacon that doesn’t taste like bacon at all, but I’m not even sure I’d qualify that as bacon anyway. Just use something you like and I promise, the rest will fall into place. *If you happen to be doing a Whole30 right now or sugar detox and need your bacon to be 100% sugar free, my favorite is the sugar free pork bacon from US Wellness Meats – I used to order this in bulk back in my days of Whole30! It’s just insanely delicious, regardless of whether you want sugar free bacon or not. 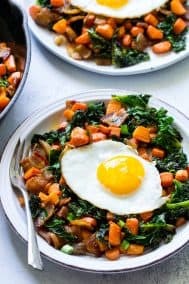 Aside from roasting the carrots, the rest of this hash comes together very quickly and easily in one pan, and you bake the eggs right into it – something I love to do lately, mainly because 1) it works and 2) it save me a pan to clean. I’m already cleaning nearly 20 pans a day (but are you really?) between my family’s meals and food I make for the blog, so, saving one where I can makes me feel like I’ve accomplished something special. I can only hope you feel the same when you make this – I’m sending you “I’m special” vibes and fairy dust right through your computer (or preferred mobile device) as you read this so let me know if it works. Even if the special vibes don’t reach you – eating a meal this nourishing and delicious will most definitely make you feel awesome – so take advantage of that and make this for yourself! 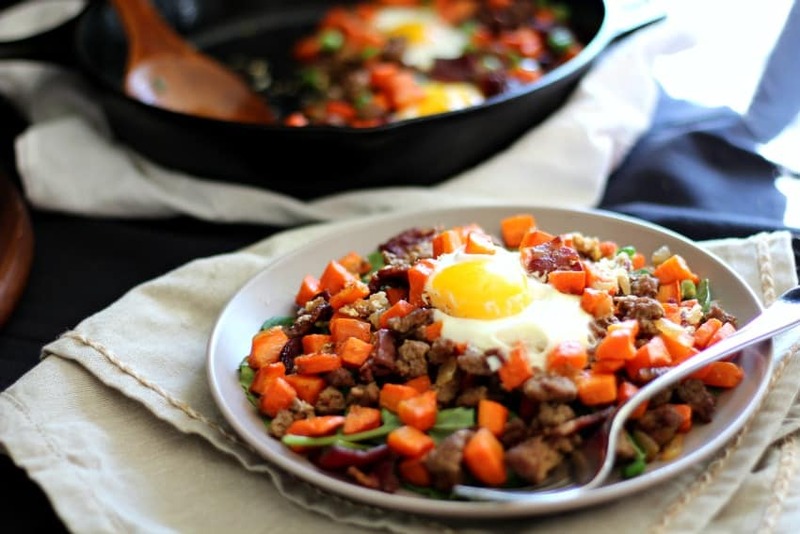 A savory, hearty, and healthy meal for any time of day, this Roasted Carrot Hash with Ground Beef and Bacon is also Paleo, dairy free, grain free, low carb. and Whole30 friendly! Preheat your oven to 425 degrees. Toss your chopped carrots with the olive oil plus salt and pepper, and spread them out on a large parchment paper lined baking sheet in a single layer. Roast in the preheated oven about 25 minutes or until soft and golden brown. While the carrots roast, heat a large oven proof skillet (I used cast iron) over med/med-hi heat. Cook the bacon in the skillet in a single layer, until about 2/3 of the way done. When the bacon is 2/3 done, drain half the fat (reserve at least one tbsp), add the diced onions and stir. Once onions begin to soften, sprinkle the ground beef into the pan, add salt and pepper to taste, and stir and cook, breaking up lumps to evenly brown. Once evenly browned, remove from heat. When the carrots are done, remove from the oven and lower the oven temp to 400 degrees. 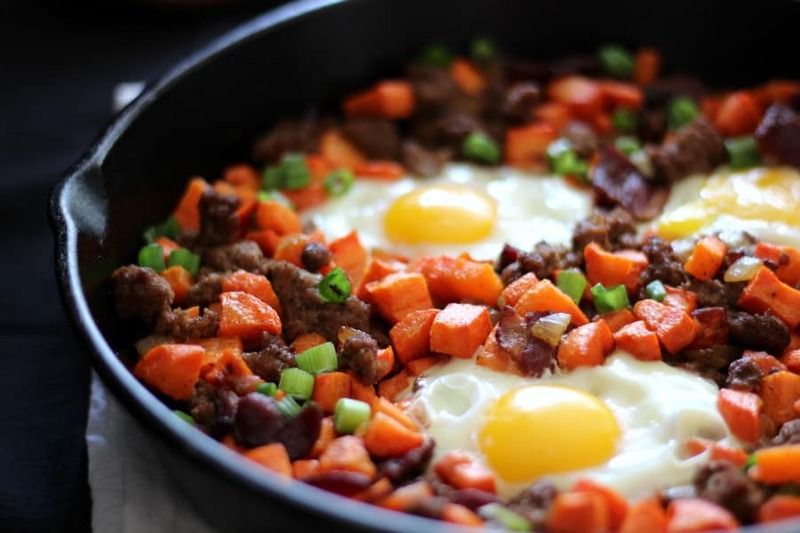 Add the carrots to the beef/bacon mixture, and create grooves for the eggs. Crack each egg into a groove, and place the skillet in the oven. Bake the eggs until they're cooked to preference - about 10-15 minutes for me. Remove from oven, and serve with sliced scallions for garnish, over greens or alone. What veggie deserves more of your love? 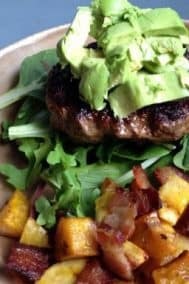 Is anyone planning a Whole30 or other detox/elimination diet for January? I love most roasted veggies, and carrots are no different. Combining them with bacon and beef sounds perfect! Roasted root veggies are definitely hard to ruin 🙂 Add meat and it’s perfect! I agree that carrots are forgotten about but that’s so true of the simple foods/recipes. Sometimes things are more complicated than they need to be! Carrots are the bomb diggity. This would be so great with so many different root veggies! Pretty much anything – can’t think of them all but can you really go wrong with roasted root veggies? I love carrots but too often just eat bags of baby carrots as a snack, always forgetting how much I love them when sauteed and roasted! I’m going to share this with my whole30 group! 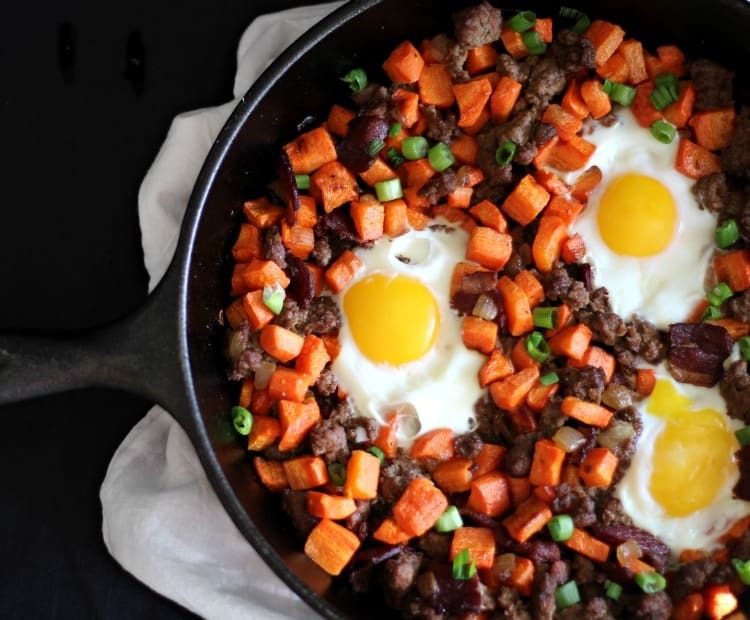 Hash is such a whole30 staple and this one looks extraordinary! I don’t give -full sized- carrots enough love, but I’m kind of addicted to the baby ones. I’ll munch on handfuls of them throughout the day, and then go a little crazy if I have hummus on hand. I could probably show brussels sprouts a little more love, though. Or maybe mushrooms. Carrots were always one of my favorite veggies! A long staple! I love eating them in a big bowl with some nut butter as a snack! Absolutely delicious meal. The whole family devoured it. Will be adding to our regular meal plan. Definitely a keeper!